Most residential, commercial and industrial molded case circuit breakers have three position handle mechanisms which are "On", "Tripped" and "Off". There are a few exceptions such as Federal Pacific NA, NC and NB types and Cutler-Hammer CH and CHB which have just two positions "On" and "Off" (tripped). 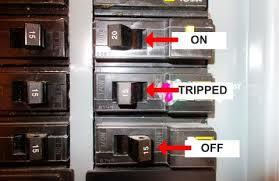 Circuit Breaker RESET INSTRUCTIONS: If your circuit breaker is tripped, the handle will be at the mid-position between ON and OFF. To reset the circuit breaker, push the handle all the way to the extreme OFF position, then push to the ON position. In the case of Federal Pacific and Cutler-Hammer types mentioned above, simply push the breaker handle to the ON position. If the breaker immediately trips, that is an indication that a fault still exists on the circuit and an electrician should be called to investigate the problem. There is also the possibility that the circuit breaker internal spring assisted mechanism has broken and the breaker will need to be replaced.